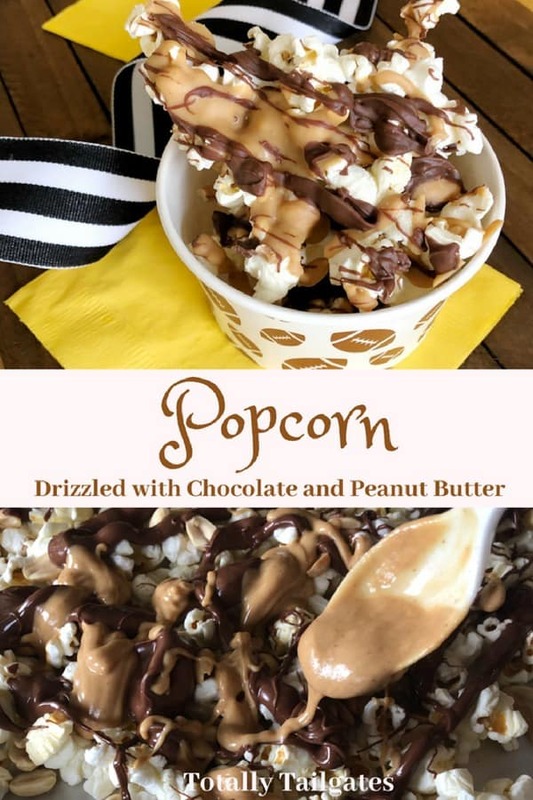 Be the snack superstar with this Popcorn Drizzled with Chocolate and Peanut Butter! 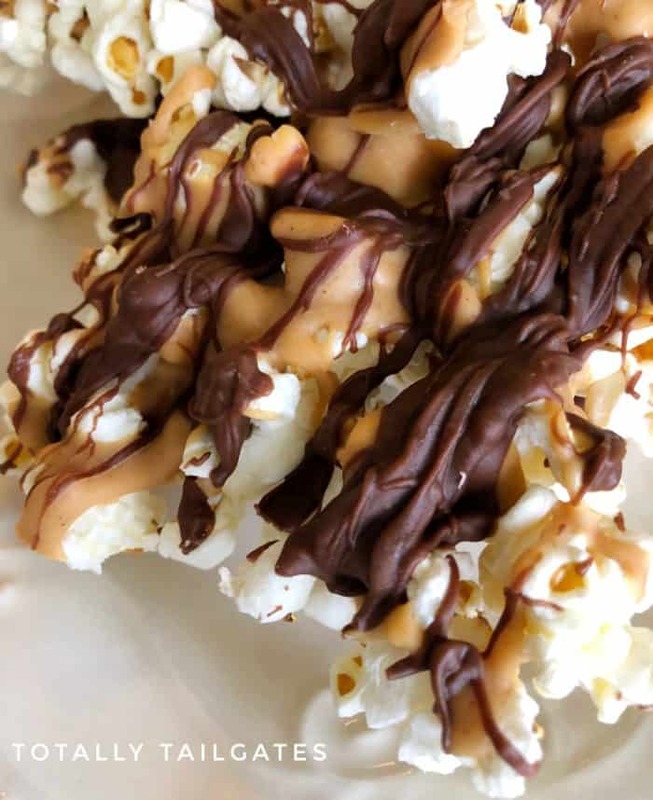 Popcorn is drizzled with decadent, melted milk chocolate and peanut butter morsels. And, best of all, it packages nicely for teacher, neighbor and hostess gifts, too! I’ve already made this snack twice this summer! It’s a no-bake masterpiece that travels well to the playground, pool, beach, tailgate or lake. Hi everyone, this is Heather from Totally Tailgates stopping by again with a snack your whole family will love. 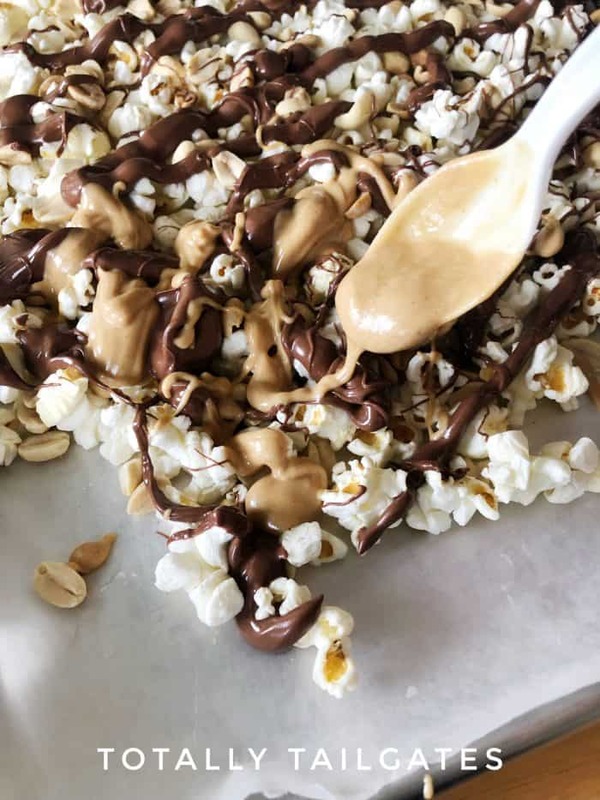 The combination of chocolate and peanut butter is just so darn good….throw in salty popcorn and a handful of peanuts and you have a just won the snack game! 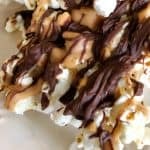 What is in Popcorn Drizzled with Chocolate and Peanut Butter? My obsession with this popcorn began innocently enough. You see, I was serving at my daughter’s school as PTA President. One of my board members gave me a basket of local goodies for Christmas. 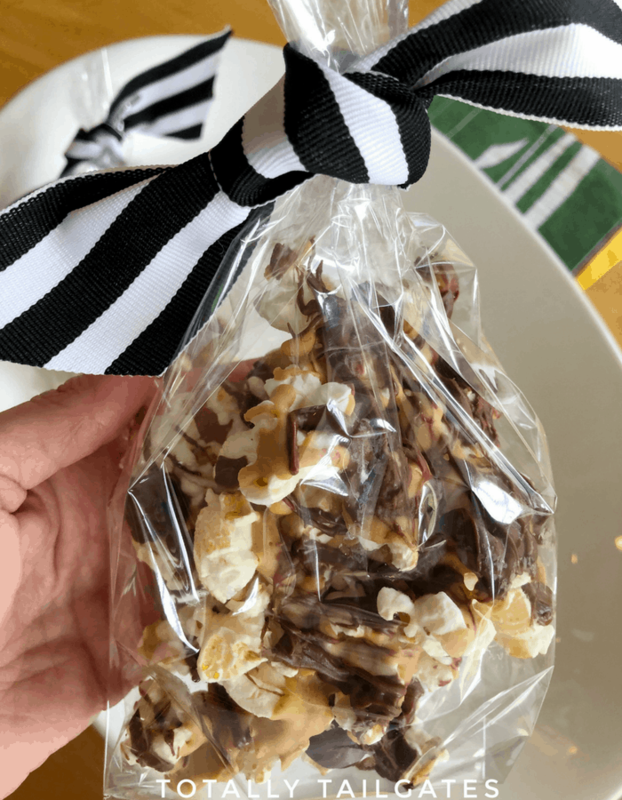 Inside was a cellophane bag with a super cute bow ….it held the most incredible confection….popcorn drizzled with milk chocolate. OMGosh – instant addiction! You see, tucked away near downtown Orlando is the quaint town of Winter Park, FL. The main hub of Winter Park is Park Avenue, which is affectionately known by locals as “The Ave”. In addition to the high end clothiers and restaurants that flank The Ave, there is a chocolatier known for it’s decadent temptations. This is a local Orlando favorite! Hostesses around town look forward to receiving these when casually entertaining friends, and they make fabulous teacher & neighbor gifts! I set out to recreate this popular confection….it is SO easy and whether you take it to the playground in a plastic baggie or dress it up with bows, EVERYONE loves them! Make sure to use high end milk chocolate morsels – they melt without needing shortening. One regular cookie sheet will hold 6 cups of popped popcorn. Cover you cookie sheet with wax paper. When you pour the popcorn on the cookie sheet, make sure the popcorn kernels touch each other without overlapping. A plastic spoon makes drizzling the melted chocolates a breeze, and the clean up is a cinch! You can double or triple this recipe for gifts – just make sure you have enough cookie sheets! Hi there! I’m Heather from Totally Tailgates….the home of Southern Sideline Hospitality. Join me for the best game day foods, fashions and stops along the way! Want to know all about sorority recruitment? I have a series on rush tips for PNMs and their mamas – it’s never too early to plan for rush! Nothing says snacking quite like popcorn and when you add chocolate and peanut butter to the mix you can’t go wrong. Nothing says snacking quite like popcorn and when you add chocolate and peanut butter to the mix you can't go wrong. Pour popcorn onto cookie sheet. Spread popcorn out making sure kernels are touching each other but not overlapping. Sprinkle peanuts on top. Pour milk chocolate morsels into a small bowl. Heat in microwave for 45 seconds. Remove and stir. Return to microwave, heating in 20 second intervals as needed, stirring between each interval until completely melted. Drizzle evenly over popcorn and peanuts. Pour peanut butter and shortening into a small bowl. Heat for 45 seconds, stir, and return to the microwave for 30 additional seconds. Stir well. Drizzle evenly over popcorn. peanuts and chocolate. Place cookie sheet into refrigerator for 3-4 hours. Remove. Break popcorn into pieces as desired. Keep popcorn in a covered container.